At 2 100m altitude, facing the glacier from la Meije, over 2000 species of alpine and mountain flowers and mountains from all over the world are gathered on 2 hectares of one of the most beautiful and high altitude garden in Europe. 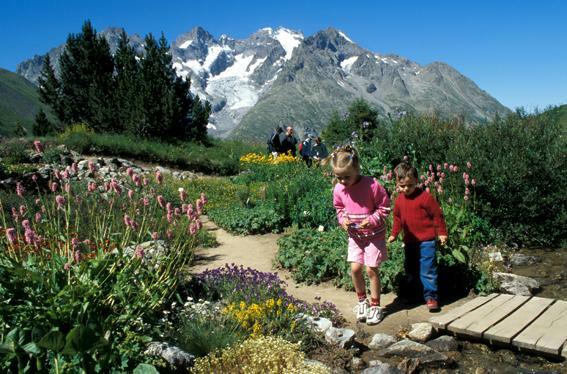 For more than a century, the Alpine Garden of Lautaret has welcomed the public (15,000 people each season), trained students and participated in research in alpine biology. Free guided tours every day in June, July and August. From 01/06 to 01/09, daily between 10 am and 6 pm. The Garden is open every year from the first weekend on June to the first weekend of September. - Daily in June, July and August at 10:30am, 2:30pm and 4pm. - Reservations required for groups. Group rate available for > 11 people. Free admission or reduced tariff at the beginning and the end of season (according to blossoming). Located at the Lautaret pass,15 minutes far from Villar d'Arene and 20 minutes from La Grave The Lautaret Garden and its Gallery are located 10 minutes walk from the parking at top of the Lautaret pass. Possible access by car and bus.